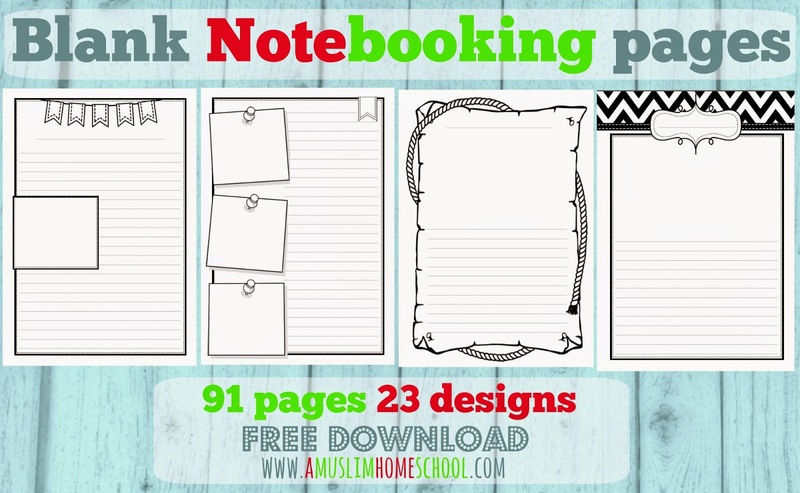 I began making this file a few months ago with the goal to produce a note-booking pages set to include 100 different designs; in order to sell on the blog. But as I go along I realise I am a huge softy because I always feel bad selling things I make! Instead I decided to make a smaller file however make it available as a free download inshaAllah. So here we have a blank note-booking page set with 23 designs, each design with 4 different layouts. Each design pretty much has a tittle page and 3 additional sheets with space provided for both text and images. To download the set, just click on the high-lighted text below! As salaamu alaykum, you sound exactly like me! I want to sell stuff, then when I've made something, I'm like gee, this will reach more people if it's free. Lol. lol exactly what I think . I make something and I want people to be able to actually use it bi'ithnillah! Jazaaki Allahoe khayran. May Allah reward you for all your efforts, sister. Baarak Allahoe feeki for sharing! You are most welcome! Thanks for commenting! Thanks for making these and offering them! I'm printing some out right now and I am looking forward to using them.